The blurb for Quests of the Kings had the magic words: “. . . for fans of Sarah J. Maas and Kristin Cashore.” That turned out to be pretty misleading. Since my expectations where high, I was pretty disappointed. The biggest difference is tone, and if you understand and embrace that before you begin reading, I think you have a better chance of enjoying the book than I did. From the author of the Riddle in Stone books comes a thrilling new series for fans of Sarah J. Maas and Kristin Cashore. Across the realms, the kings’ quests captivate the imaginations of nobles and commoners alike. These dangerous competitions pit the most daring adventurers against each other as they compete for riches and glory for their kingdoms. Plain and ordinary Natalie, a sixteen-year-old peasant girl, loves listening to stories about famous adventurers, but the thrilling action of the kings’ quests seems far removed from her everyday life of mucking out stables and working every odd job she can find to support her siblings and disabled mother. However, after a violent run-in with Brago, a ruthless adventurer who believes Natalie is a threat to his mission, she is dragged unwillingly into the latest contest. On the run from Brago, Natalie seeks refuge with a rival adventurer, the legendary Sir Edris, and his squire, Reg. 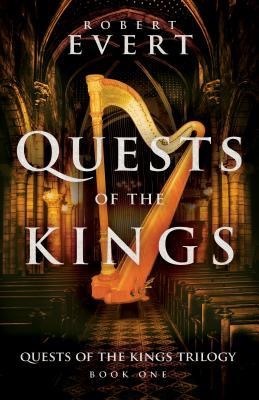 As they toil together to find the object all of the kings desire–an ancient golden harp–Natalie starts to feel safe with the fatherly knight. Yet, despite Edris’s protection, Brago is never far behind. When one of Brago’s cruel plots separates Natalie from her protectors, she must become as strong and cunning as the adventurers of old to save her friends and stay alive. So, you think this sounds and looks like a serious book, right? You would be wrong. This reminded me more of the T.H. White take on Arthurian legend. It is lighthearted, even at the most dire of times, and the quest is complicated and strung along as characters bumble and fumble around. Entire pages are dedicated to conversations and bickering about unimportant things for the sake of humor, and the really terrible things are treated with fleeting gravity. It is very Monty Python at times. If that is what you enjoy, this book does play the comedic element to the hilt. The main character’s appearance is made fun of in a variety of ways, her feminist stance takes the form of tirades that everyone ignores, and her ideas always go really wrong. The men who get stuck with the thankless job of protecting and rescuing her frequently end up really regretting it. I don’t particularly enjoy the style, so this became a chore rather than a pleasure to finish. The language and sexual references are intended to be comedic and are pretty harmlessly bawdy and immature, but I’m not sure they are appropriate for the crowd most likely to appreciate the style – middle school readers. I would say this is probably grade 7+ interest level but more appropriate for grades 9+.